Form apps tend to be pretty similar. Most offer the same field options, have drag-and-drop editors, and provide basic themes. Most save your results in a spreadsheet-like grid and send you an email notification for new responses. So how should you choose the right app for your needs? Does the tool you choose even matter? 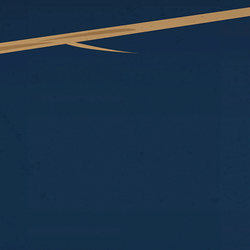 For most businesses, it does matter, just not in as broad of strokes as you might anticipate. It's in the tiny details where you'll find the most differences—the little things that help forms fit your business's needs and make customers want to fill them out. To save you time, we tested more than 30 online form builder apps to find those differences and help you choose the right one. What Makes a Great Online Form Builder? The way form builders work is relatively straightforward. You create labels and questions for the pieces of information you're looking to collect, and respondents use the fields you establish—free form text boxes, dropdowns, radio buttons, and more—to provide that information. You can also set certain fields as required or optional and restrict the types of responses you receive to have more control over the data you collect. And although building forms and collecting responses is a straightforward process, form apps come in all shapes and sizes. 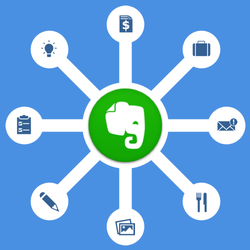 There are simple, standalone form apps, form builders that are built into spreadsheet apps, and advanced data processing tools that happen to be built around forms. We felt our final criterion, "designed to work on any website," was key. There are a lot of form builders designed for WordPress—we're fans of Gravity Forms, Ninja Forms, Formidable Forms, and WPForms—and Squarespace and Wix offer built-in form builders and platform-specific extensions. In this article, we wanted to focus on form builders you could use on any platform, so we eliminated those that were designed for a single platform only. 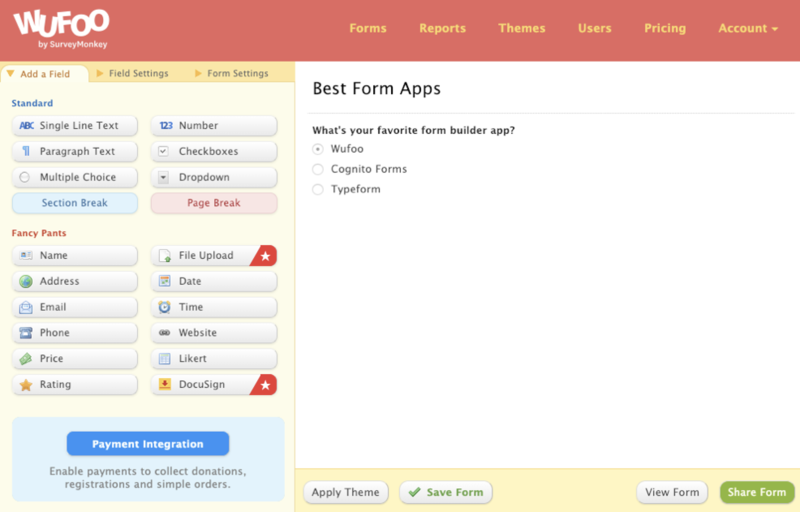 Using those criteria, we narrowed down our list of more than 30 apps to the following 11 best form builders. Forms, surveys, and polls are all very similar. If you're not sure which tool is right for your needs, check out our explanation of the difference between the three. 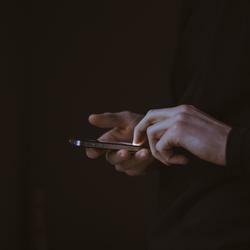 Then, if you decide that an online form isn't exactly what you need, check out our guide to the best survey apps, the best online poll apps, or the best remote data collection apps. 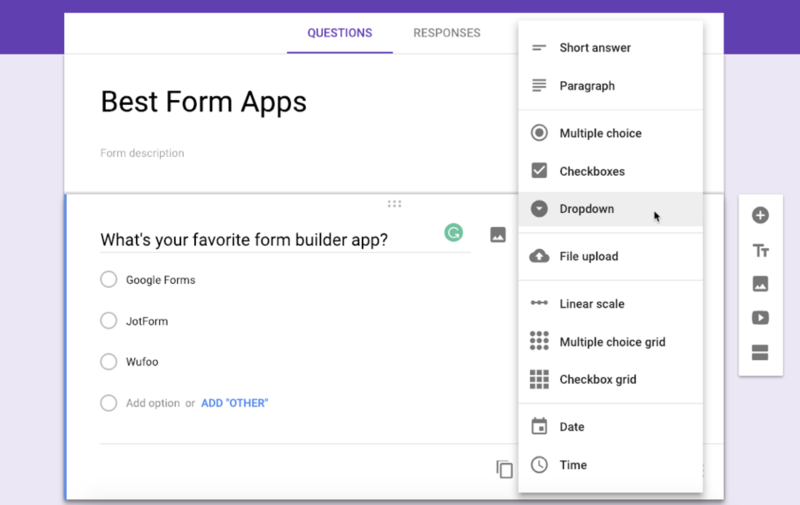 Google Forms is an excellent form builder app for many reasons. First, it's entirely free; you just need a Google account to use it. Second, it automatically saves your form results to a Google Sheets spreadsheet for advanced analysis. Finally, it's incredibly fast: Adding and editing form fields in the Google Forms editor is noticeably faster than using almost any other form app. Google Forms includes all the basic form fields you'd expect. While you can't accept payments, there are options for short- and long-answer text boxes, checkboxes, multiple choice selections, dropdown menus, file uploads, and more. You can set questions as required or optional, add images or videos, build a form that acts like a quiz and scores answers, or add some basic conditional logic that adjusts what questions people see based on the answers they provide. Choose from a variety of pre-built templates before populating your form with questions, or customize it when you're finished with basic color and photo themes. You can also add extra fields and features with Google Forms add-ons—something few other form apps offer—and you can share the form with your team to collaborate on it. Then, with its Google Sheets integration, you can use the power of a spreadsheet to validate your form entries and put your form data to work with customized reports and lists. And from there, you can use the Zapier integration to send that data to 1,000+ other apps. If you prefer Excel over Google Sheets, Microsoft Forms may better suit your preferences. Microsoft Forms is Microsoft's answer to Google Forms, and it works largely in the same way. 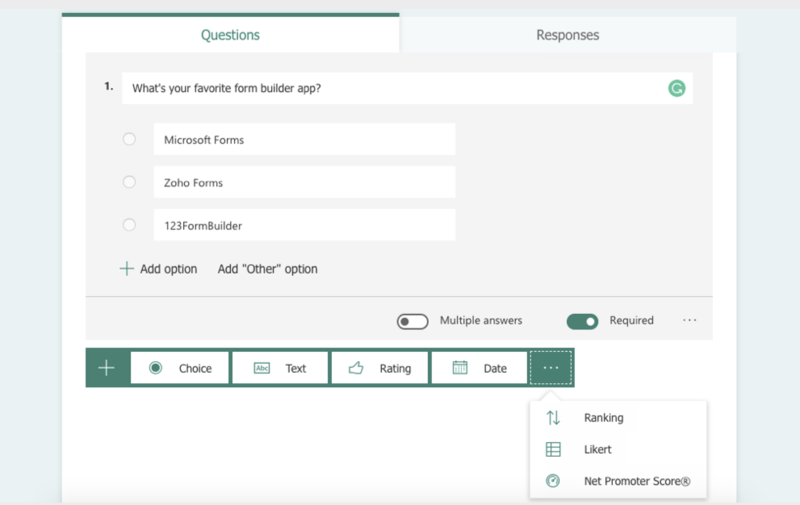 Adding questions to Microsoft Forms is fast and simple: Add a question, choose the answer format, and type in your questions and response options. And while Microsoft Forms doesn't offer some of the response types you'll find in Google Forms—it doesn't allow respondents to upload files, for example—it does have response types you won't find in Google Forms, like Net Promoter Score. When you're finished building your form, you can send people a direct link to respond, or you can grab the embed code to add the form to your website or embed it in Sway. Then, get a quick overview of your responses within the Microsoft Forms interface, or open your responses in an Excel spreadsheet to do more detailed digging through or visualization of your collected data. If you prefer Airtable to both Google Sheets and Microsoft Excel, you might want to consider Airtable's form builder. It works differently than other form builders; instead of building your form first, you start by building a database. Your database collects form responses and lets you take advantage of Airtable's powerful features for organizing, reviewing, and visualizing the data you collect. Airtable is free for unlimited forms with up to 1,200 entries per form. Wufoo was one of the first form tools to make online forms look good. And it's part of SurveyMonkey, one of the earliest web apps with a history dating back to 1999. It's probably no surprise, then, that Wufoo's form builder looks a little dated. But appearances, in Wufoo's case, are deceiving. What Wufoo lacks in modern design aesthetics, it makes up for with extreme customizability. While forms created in Google Forms and Microsoft Forms all tend to look very much alike, Wufoo lets you build a form that's completely unique. Adjust how text and form fields are aligned on the page, display response options in multiple columns, and build custom themes with backgrounds, fonts, and colors you choose. And with a premium plan, you can create branching and logic to redirect respondents to different questions based on previous answers, add payment fields to integrate your form with your preferred payment gateway, or include a DocuSign field to collect signatures. Once you have results, you can send that data anywhere you need with Wufoo's Zapier integrations. Plus, Wufoo has a powerful report generator that's just as simple to use. Add a name, select the form data, choose the table or graph style you want to use to show that data, tweak a few settings, and seconds later you'll have a detailed, graphical report without ever having to open a spreadsheet. That alone is a reason to try it out—it's one of the easiest ways to put your form data to work. Wufoo Price: Free for one user, up to five forms, and unlimited reports; from $19/month for the Starter plan that includes up to 10 forms, 1GB uploads, and maximum fields. JotForm lets you build a free form that does everything you need it to do and looks exactly how you want it to look. JotForm's forms are much more customizable than forms created on Google Forms and Microsoft Forms, and unlike Wufoo, JotForm even lets you do things like accept payments and collect signatures without upgrading to a premium plan. To start, JotForm offers more than 10,000 form templates that cover everything from contact forms and employment applications to new patient registration forms and market research surveys. Use those templates, or start with a blank slate, to build single-page or multiple-page forms, including multiple-page forms with each question appearing on its own, separate page. Then, add a logo, build or edit your form using nearly two dozen different types of form fields, set up payment integrations, and take advantage of a variety of widgets that let you do things like collect signatures, validate emails, add a progress bar, and much more. The best part is that all of this is available with a free account. You only need to upgrade if you need to build more than five forms, collect more than 100 responses a month, or want to remove the JotForm branding from your form. When someone responds to your form, you'll receive an email with the responses—or you can use JotForm's Zapier integrations to send the responses to the other apps you use most. If you need to work in a spreadsheet or create visuals, JotForm makes it easy to do that, too. Download your responses as an Excel spreadsheet, HTML table, or visual report. And if you don't want to have to look through emails for every response, you can also set up an RSS feed to review your responses in your favorite RSS reader app. JotForm Price: Free for up to five forms with JotForm branding; from $19/month for the Bronze plan that includes up to 25 forms without JotForm branding. If you need form responses to go through an approval workflow, or if your company is in a highly regulated industry, Formstack may be the best option for your business. With Formstack's workflows feature, you can build approval workflows to send form data to the correct people at your company and let them review it online or via email before sending it to the next person on your team—or saving the data in an app through an integration. And for regulated industries, Formstack offers specific HIPAA- and GDPR-compliant forms that keep respondents' private data secure. Additionally, Formstack will warn you if your form doesn't meet Section 508 Compliance standards—e.g., they won't work with assistive technologies like screen readers—ensuring everyone can fill your forms out. And once they do, you can send their responses to other apps with Formstack's Zapier integrations. Wondering if your form would work better with different descriptions or with the form fields in a different order? Formstack includes an A/B testing tool to let you compare two versions of your forms directly. It also provides detailed analytics that show you how people found your forms—and who was most likely to fill them out. Formstack is the app to try if you're looking for a more advanced way to manage your form data and build forms that get the results you need. Formstack Price: From $19/month for the Bronze plan that includes one user and up to five forms. Typeform tosses away the old conventions of a long page of questions and response fields. Typeform's forms are uniquely designed, showing one question at a time and blurring out the others. Respondents can tap a designated key on their keyboards to select multiple-choice options, type to sort through dropdown menu options, and press Enter to jump to the next field. This rental form application template is a good example: You can fill out the entire form using only a keyboard. It might not work for every form, but you'll find new ways to use forms with Typeform since forms can include cover pages, paragraphs of text, and multimedia along with traditional form fields. It's also one of the best options if you want your form to look great on mobile: Typeform's oversized buttons are far easier to use on a touchscreen than standard radio buttons. Once users have submitted their forms, you can automatically send their answers to any other app you use—be it a CRM, email marketing tool, or anything else—using Typeform's Zapier integrations. Typeform Price: Free for 10 questions per form and 100 responses per month; from $35/month for the Pro plan that includes unlimited fields and responses along with logic jumps and payment fields. Forms are for gathering data, but sometimes you have to tell a story before people start telling you theirs. Paperform is designed for just that with forms that look more like a landing page or blog post than your standard list of form fields. Add photos, headings, video, and long-form text to use your form to tell the story behind your offerings. It's a nice substitute for a landing page builder, letting you collect visitor data on custom landing pages for things like PPC ads and targeted marketing campaigns. A quick scroll through some of Paperform's templates shows you the many things you can do with a non-traditional form: create product catalogs complete with ordering and payment fields, accept restaurant reservations alongside location maps and contact info, embed application fields into a page that includes your job listing, and more. 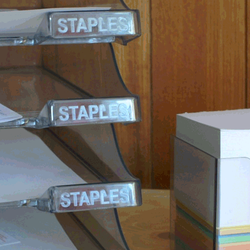 Building a form in Paperform is as simple as creating a document in your favorite word processor. Start typing to build your form, tap Enter to move to a new line, and use sub-menus to do things like add images, align content, transform text into headers, and add questions and response fields. When you're finished, choose what happens after someone submits the form: Have Paperform send an email, display a success page, or redirect respondents to a page on your website. Or you can use Paperform's Zapier integrations to automate the process even further and get your info to more apps. Paperform Price: From $15/month for the Essentials plan that includes one user, unlimited forms with Paperform branding, and 1,000 submissions per month. Need to make sure your form data is secure? Formsite lets you encrypt the text in specific form fields—that means it scrambles it so that responses appear unintelligible to people without permission to view them. It comes with built-in payment processing integrations like PayPal and Authorize.net, or you can use encrypted fields to directly accept credit card or ACH data through your form. You can also reuse form blocks and data in Formsite. Build a standard billing block, and then embed that block into other forms so you don't have to recreate it over and over again. Or you can link multiple forms together, pull responses users submitted in one form over to another so customers don't have to fill out their info multiple times, or even combine the results of multiple forms to view data together. And once responses have been submitted, you can be sure the data gets where it needs to go with Formsite's Zapier integrations. It's one of the more expensive form apps in this roundup, but it helps you do more with your form data than you could in many other apps. Formsite Price: Free for up to five forms and 10 results/form; from $19.95/month for the Deluxe plan that includes up to five forms and 500 results/form. 123FormBuilder is exceptionally simple to use. Start with a blank form, or select from more than 1,400 templates for everything from simple contact forms to agricultural tax exemption forms. After selecting a template, you can add fields quickly and easily for all of the data you need to collect using 123FormBuilder's drag-and-drop editor. Once you've finished building your form, there are several pre-built templates you can use to style it, but for the most part, the forms you create in 123FormBuilder are fairly basic in design. You can, however, do things like adjust the size of your form, increase or decrease the padding between the form and its borders, and either select custom colors or upload your own template. You won't wow anyone with a form built in 123FormBuilder, but if you're looking for a basic form that lets you collect some information, it's perfect for your needs. Plus, the data is equally as powerful once you put 123FormBuilder's Zapier integrations to work. 123FormBuilder Price: Free for up to five forms, 10 fields/form, and 100 submissions per month; from $24.99/month for the Gold plan that includes up to 20 forms, unlimited fields, 5,000 submissions per month, and native third-party app integrations. Cognito Forms is ideal if you need to create forms with advanced features like calculated fields, file uploads, conditional logic, and repeating sections—and create those forms on a budget. On Cognito Forms' free plan, you can create unlimited forms with all of the features above and accept up to 500 entries per month. You'll only pay a one percent fee for accepted payments (through Stripe), and you only need to upgrade if you need more than one user, want to remove the Cognito Forms branding, start getting thousands of responses, or need more advanced features like HIPAA compliance or data encryption. Building a form in Cognito Forms is simple—like all of the tools on this list, it offers pre-built templates and a drag-and-drop editor. And forms are fairly customizable: You can sort questions and response fields into different columns, insert page breaks for multi-page forms, and adjust styles like fonts, text size, background colors, form widths, and more. 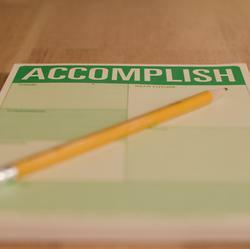 The end result is a streamlined and clean form that provides a distraction-free way to collect data. And like most of the other apps on this list, it has a robust Zapier integration to let you send your data to where it's most useful to you. Cognito Forms Price: Free for one user and unlimited forms with up to 500 entries per month; from $10/month for the Pro plan that includes two users and up to 2,000 entries per month. Zoho makes CRM, email, accounting, document editing apps, and much more—and Zoho Forms ties them all together. If you have a Zoho account, you can start building forms in Zoho Forms for free. You can use form rules to create tasks and send emails from Zoho when forms are filled out, or use its integrations to add form data to Zoho CRM, Zoho Creator, and more. Zoho Forms' Zapier integration lets you send that data to even more apps. Finally, Zoho Forms is built for teams, so it makes it easy for you and your colleagues to work on form responses together. You can approve form responses or view stats right from the Zoho Forms mobile app—or share data from forms in the other Zoho apps your team is using. If you need to build forms that fit into your company's entire workflow—and especially if you already use Zoho apps—Zoho Forms is a great option. Zoho Forms Price: Free for three forms and 500 submissions per month; from $10/month for the Basic plan that includes unlimited forms, 10,000 submissions per month, and payment integrations. For more advanced, database-powered forms, check out Zoho Creator. It's another Zoho app that lets you build your own database-powered apps, collect data via forms, and much more. With all the form builder apps listed here, and many more that work with Zapier, it's difficult to pick the perfect form app. Each of these form apps has its own attractive features, and they all let you make a wide variety of forms with ease. If one of their unique features stuck out to you, give that one a try and see if it works for you. Otherwise, it's hard not to recommend Google Forms. For most standard forms, Google Forms includes the form features you need, for free. Since it saves your form results to a spreadsheet, you can easily sort and filter your form data without having to import it into another app. But if you prefer Excel, Microsoft Forms is a solid alternative to Google Forms and Sheets. For more features than that, Wufoo is a great option for awesome reports, and JotForm and 123FormBuilder are easy to use with lots of templates to help you build forms quickly. Typeform is best if you want to build interactive forms that feel like mini-apps, and Paperform is a fun way to make a form that looks and feels more like a landing page. Formstack and Formsite have features that make them appealing for more complex business needs and workflows, while Cognito works well if you need to build complex forms on a tight budget. Finally, Zoho Forms is the way to go if you already use other Zoho apps. It can be tough to pick between all of the options, but each of these form builders works great, and they all let you make forms and put your results to work. You've found the form app that fits your needs, signed up for a new account, and built your first form. 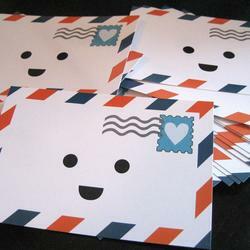 With any luck, you'll have new responses coming into your form soon. Now what? It's time to let your form work for you with Zapier's app automations. Connect your form to Zapier to build automated workflows with more than 1,000 apps. Want to get an SMS notification every time your form is filled out, then save that form entry to a spreadsheet? Done. Need to tell your team in Slack about form entries, email a template document to your contact, then log all the details to your CRM? Done. Instead of having to wait for all your form entries to come in, then downloading and importing the form data into your app from a .csv spreadsheet file, Zapier can put your form data to work automatically. 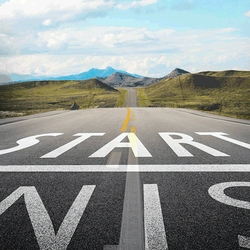 Here are some ways to get started. New to Zapier? Learn how to set up your first automated workflows in our Zapier Getting Started guide. There's no need to export your form data manually. Zapier can automatically add every one of your form entries to a spreadsheet, database, or another app. It can even save results to multiple files so you can share data or automatically back up your form results. Need to know instantly when someone's filled out your form? These Zaps can do that for you, sending a notification to the messaging app of your choice as soon as your form is filled out. If your form includes a file upload field, you'll want an easy way to save and use those attachments. These Zaps can save your attachments to Dropbox, Google Drive, and more so you'll never have to download files from your form results manually again. If you need to turn your form submissions into a nice-looking document like as a contract or application, connect your form to WebMerge or Dropbox via Zapier. With this integration, your form results can be automatically turned into a template PDF, Word document, Excel spreadsheet, PowerPoint presentation, or plain text document. When you have a form result that requires more action, make sure you don't forget to follow up. Zapier can connect to your project management or to-do app and add new tasks anytime a form is filled out, complete with data from your form so you won't have to go look up the info again when it's time to work. Want to keep in touch with people who fill out your form or trying to gather sales leads? These Zaps can add your contacts to your CRM or address book so your sales team can act right away. You can also add form respondents to your newsletter list by connecting your form to your email marketing app with Zapier. Sometimes you only need some of your form results—the people who replied "yes" to your email contact form, or the customers who actually made a purchase from your form. 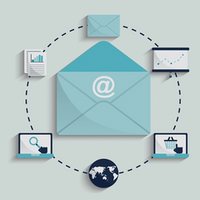 Or maybe you want to do something different with your form results depending on the answers—perhaps sending a different email to people who entered a company email address than those who entered a personal email address. Zapier's Filters can help. Add one to your Zapier workflow, and it can watch for specific form entries and only run your Zap when you want it to run. It's the best way to customize your form automations. Check out our guide to Zapier Filters for detailed steps on how to filter your form results. Those are only a few of the ways your forms can work for you, automatically. With a great form and Zapier's integrations, you can collect data and use it in your business faster than ever. Now that you've found the perfect form app, it's time to learn how to get the most out of it with the best features in your form app. In chapter four of this guide, you'll learn how to use form logic, hidden fields, field validation, file uploads, and more to build better forms with the most powerful form features. Then you can use your new form to do anything you want—gather contacts, sell your products, automate your workflows, or even build an entire app powered by a simple form. Learn how to do that from dozens of startups in chapter five's guide to optimizing form apps for your work. 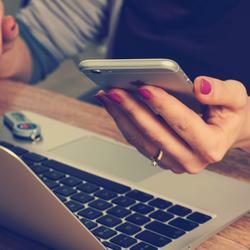 But first—want to gather data on the go with mobile apps? In the next chapter, you'll find the best mobile data collection apps—the form apps designed for mobile that didn't fit this roundup but are still great ways to gather data. Originally published in June 2014, this post has been updated by Jessica Greene with each app's latest features and pricing, plus great new form builders like Microsoft Forms. Written by Zapier senior writer Matthew Guay.